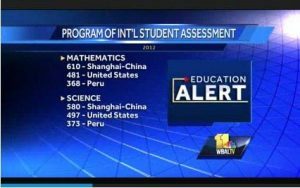 The 2012 Program of International Student Assessment (PISA) has carried out an international comparative trial of student performance in reading comprehension, calculus, and natural science. The US ranks 36th out of 64 countries testing ½ million 15 year olds, as shown in Figure 1. What is the problem? Existing acoustical designs and products have not evolved to incorporate the current state-of-the-art and the result is schools that are failing to meet their intended goals. 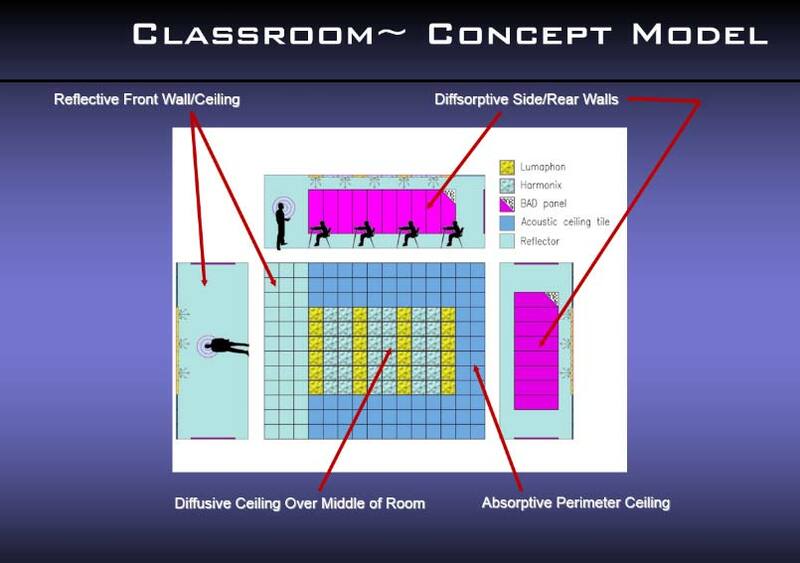 Learning areas are only beginning to include adjustable intensity and color lighting, shown to increase reading speeds, reduce testing errors and reduce hyperactivity; existing acoustical designs are limited to conventional absorptive-only acoustical materials, like thin fabric wrapped panels and acoustical ceiling tiles, which cannot address all of the speech intelligibility and music appreciation challenges. What is the solution? Adopt modern products and designs for core and ancillary learning spaces which utilize binary, ternary, quaternary and other transitional hybrid surfaces, which simultaneously scatter consonant-containing high frequency early reflections and absorb mid-low frequencies to passively improve the signal to noise ratio, adopt recommendations of ANSI 12.6 to control reverberation, background noise and noise intrusion and integrate lighting that adjusts to the task at hand. Let’s begin by considering how we hear and understand what is being said when information is being delivered via the spoken word. We often hear people say, I can hear what he or she is saying, but I cannot understand what is being said. The understanding of speech is referred to as speech intelligibility. How do we interpret speech? The ear / brain processor can fill in a substantial amount of missing information in music, but requires more detailed information for understanding speech. The speech power is delivered in the vowels (a, e, i, o, u and sometimes y) which are predominantly in the frequency range of 250Hz to 500Hz. The speech intelligibility is delivered in the consonants (b, c, d, f, g, h, j, k, l, m, n, p, q, r, s, t, v, w), which occur in the 2,000Hz to 6,000 Hz frequency range. 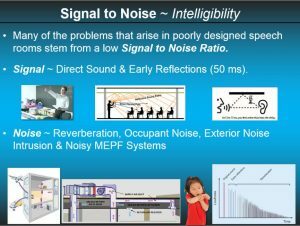 People who suffer from noise induced hearing loss typically have a 4,000Hz notch, which causes severe degradation of speech intelligibility. 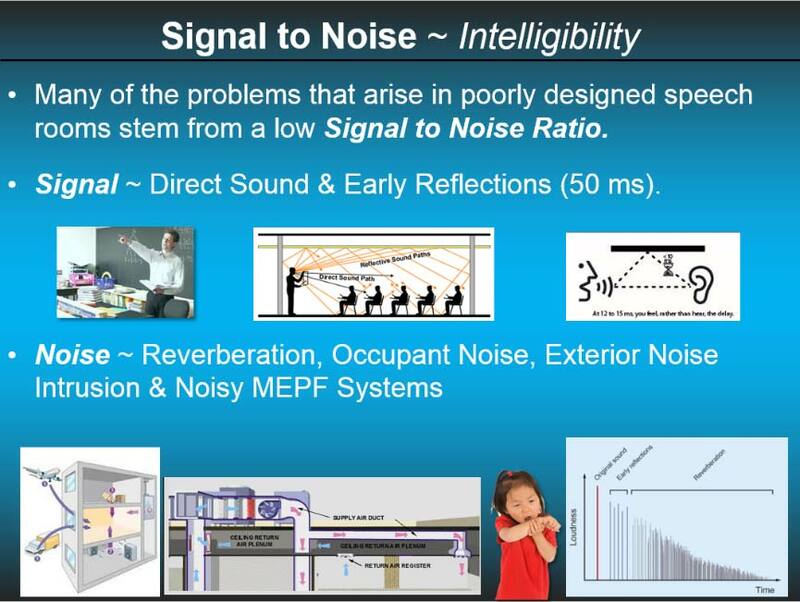 I raise the question, “Why would we want to use exclusively absorption on the entire ceiling of a speech room and thin fabric wrapped panels on a significant proportion of wall areas, when these porous materials absorb these important consonant frequencies and prevents them from fusing with the direct sound making it louder and more intelligible? Exclusive treatment of absorbing material on the ceiling of the room may excessively reduce the high-frequency consonants sound and result in the masking of high-frequency consonants by low-frequency vowel sounds, thereby reducing the signal to noise ratio (SNR). The signal has two contributions. The direct line-of-sight sound and the early reflections arriving from the walls, ceiling, floor and people and items in the room. So the signal consists of direct sound and early reflection. Our auditory system, our ears and brain, have a unique ability called temporal fusion, which combines or fuses these two signals into one apparently louder and more intelligible signal. The goal then is to utilize these passive early reflections as efficiently as possible to increase the signal. The denominator in the SNR consists of external noise intrusion, occupant noise, HVAC noise and reverberation. These ideas are summarized in Figure 2. In Figure 3, we illustrate a concept model for an improved speech environment, whether it is a classroom, a lecture hall, a meeting/conference room, essentially any room in which information is being conveyed. The design includes a reflective front, because the vertical and horizontal divergence of the consonants is roughly 120 degrees, so if a speaker turns away from the audience, the consonants must reflect from the front wall and ceiling overhead. The perimeter of the ceiling is absorptive to control the reverberation (noise). The center of the ceiling is diffusive to provide early reflections to increase the signal and its coverage in the room. The mid third of the walls utilize novel binary, ternary, quaternary and other transitional diffsorptive (diffusive/absorptive) panels, which scatter the information above 1 kHz (the signal) and absorb the sound below 1 kHz (the reverberation=noise). 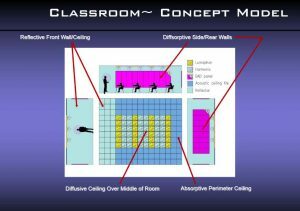 This design suggests that the current exclusive use of acoustical ceiling tile and traditional fabric wrapped panels is counterproductive in improving the SNR, speech intelligibility and coverage.